Create backups of valuable files regularly and ensure the safety of your files. In case of loss of files, simply restore them from a backup. When creating Exiland Backup, we focused on the simplicity of the interface and the speed of copying files. All you have to do is to create a task by specifying the source folders that you want to copy, the schedule for running the task, and the folder where to save the backups. Everything else the program will do for you! In addition, you can copy the source files with the specified compression level to a ZIP archive, encrypt them, split the archives into volumes, and duplicate backups to any locations for greater security: Local Network, NAS storages, FTP, SSH servers (UNIX), synchronize files and much more. Exiland Backup runs on all Windows and Windows Server operating systems. successfully use Exiland Backup to protect their data! License key with no expiration date (Lifetime license)! VSS (Volume Shadow Copy) for locked files such as Outlook *.ost, *.pst, and etc. Unlimited time license (Lifetime license)! Backs up files automatically on schedule, on PC start, on connecting a USB device, from the Windows command line (.bat) or manually by clicking the "Run" button. Fast ZIP compression in standard ZIP format, with AES-256 encryption, with optional splitting of large ZIP archives into multiple volumes, password protection. Restores files from a backup. You can quickly restore the lost files to the specified folder or to their original location. 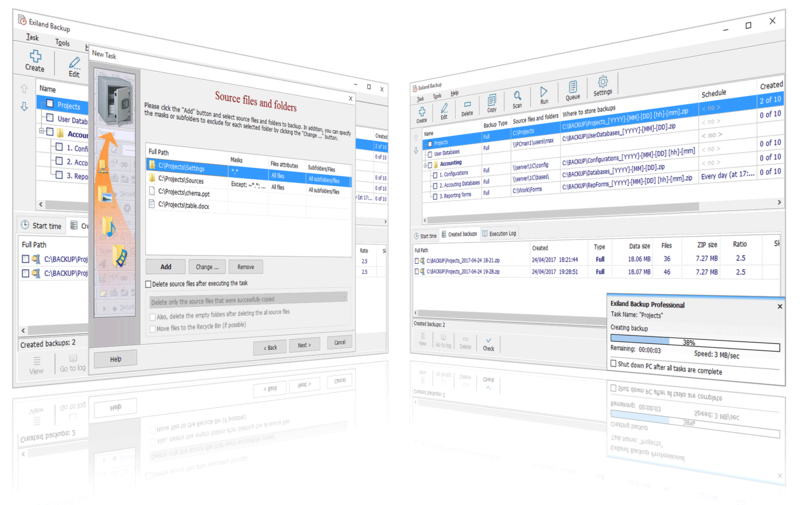 We're excited to announce the new version of Exiland Backup 5.0. About all the changes made in this version you can find out on the Version History page. The new version of Exiland Backup Free 4.9 from July 10, 2018 has become available for download. About all the changes made in the Free edition of the program you can find out on the Version History page. The new version of Exiland Backup 4.9 (Standard and Professional) was released. The Professional edition supports VSS (Volume Shadow Copy), which allows you to create a "hot" backup of open files *.pst,*.ost when running MS Outlook, MSSQL, and etc. The program is translated into Chinese language, some internal errors and defects are fixed. The new version 4.8 of Exiland Backup was released. It allows you to scan FTP/SFTP directories 5-10 times faster than the previous one! The GUI was translated into Polish and some bugs were fixed. The new version 4.7 of Exiland Backup was released. Garbage Collector was added and some features were improved. See the version history for details. The new version of website and the new version 4.6 of Exiland Backup were released. User Accounts are added to the website. Added the support of the safety SFTP (SSH) protocol to the program. Also, some features and improvements were added, and some bugs were fixed. See the version history for details. The new version 4.5 of Exiland Backup was released. The user interface was translated to Ukrainian and Turkish languages. The main innovation of version 4.5 is complete replacement of the FTP component. Also, some features were added, and some bugs of version 4.4 were fixed. Forums and Documentation of Exiland Backup have been added to the website. The new version 4.4 of Exiland Backup was released. The user interface (UI) was translated to the German language. Also, some features were added, and some bugs of version 4.3 were fixed. The new version 4.3 of Exiland Backup was released. Some improvements and optimizations were added in the program. Several bugs were fixed. The new version 4.2 of Exiland Backup (Free, Standard, Professional) are released. The main innovation of version 4.2 is unicode support. Furthermore, some improvements were added in the program. Several bugs were fixed. How does the Exiland Backup work? 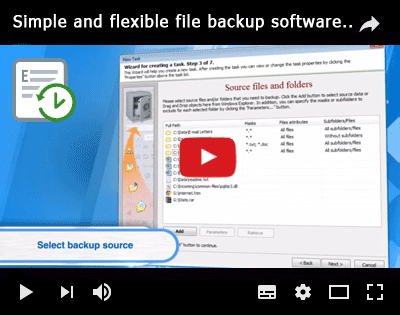 You will get the full control over backup creation with Exiland Backup! During operation, the utility writes the most detailed and clear log. 4/21/2019 1:00:58 PM Starting the "My working files" task. 4/21/2019 1:03:05 PM Operation completed successfully. Duration: 1 min 40 sec. 4/21/2019 1:03:05 PM Connection to the FTP server "store-server.com" has been established successfully. 4/21/2019 1:03:05 PM Copying the ZIP archive to the folder "ftp://store-server.com:21/public_html/backups"
4/21/2019 1:04:15 PM Warning: Connection with FTP server was interrupted. 4/21/2019 1:05:00 PM Connection restored. Task resumed. 4/21/2019 1:07:35 PM Operation completed successfully. All files have been copied. Duration: 3 minutes 45 sec. 4/21/2019 1:07:35 PM Finishing the task. Total duration: 5 minutes. 25 sec. Why do system administrators choose Exiland Backup? The backup utility is easy to use. The program icon resides in Notification Area with the program window hidden by default (click the icon any time to open/display the main window). The program automatically backs up all or only the modified files 30% faster than analogs. Configure your task once, and your files will be reliably protected from any threats.